When you’ve lived in your house for years, it may be difficult to determine whether it is still stylish and functional. Perhaps, you’ve become so used to the light blue toilet, dirty fixtures, and peeling wallpaper you didn’t even realize your bathroom is now outdated. Or, you may not realize that new vanity storage options and well-placed hooks and towel bars can turn your cluttered bathroom into a well-organized retreat. It’s okay. Bathrooms are often overlooked. It’s only when the sink is overflowing, and the toilet is clogged that they get a second thought. But, your bathroom is one of the most utilized rooms in the house. You shouldn’t spend your time in there wrestling with worn fixtures and tripping over towels that don’t have a place. Instead, your bathroom experience should be pleasant, whether you’re frantically getting dressed in the morning or taking a relaxing soak in the tub. If your bathroom design still includes pastel colored toilets and tubs, it’s well past due for an update. A classic color scheme with white, gray, beige, or other neutrals will give your bathroom a new life, like the ones shown here. If you’re not interested in fixing up your bathroom for yourself, think about future buyers and your guests. Brown water stains on the ceiling below the bathroom indicate an update is needed ASAP. You have a leak, which could also impact other areas in the home. Get your plumbing investigated immediately and take the opportunity while fixing this to update your bathroom design and install modern fixtures. This is important for your own use as well as for visitors and resale value. No one wants to see the stains left by leaky fixtures and water damage. The bathroom lights shouldn’t blind you, nor should they be so dim you can’t see yourself in the mirror. Better fixtures, a multi-layered lighting scheme, and brighter bulbs can transform a drab space. Bathroom tiles and tubs get worn out over time from every day wear and tear, as well as chips and other damage. 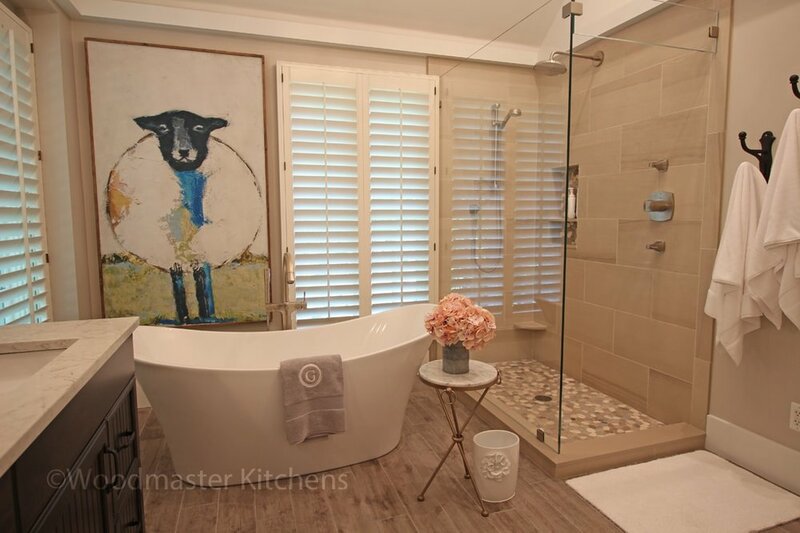 Most tubs are the focal point of the bathroom design and chips and cracks should be addressed immediately. Broken tiles on the floor and walls should be replaced quickly. It is both unsightly and potentially dangerous. Older homes often have smaller bathrooms with odd layouts; and if you’ve ever experienced this you know how frustrating it can be. Even newer homes can benefit from optimizing the layout in a bathroom design to get the most out of your space. Try staging the most used features in easy to access places and up against the wall to allow for optimum space. Consider who will be using the room and how often and create a layout that meets your needs for that space. Storage is a key feature in any bathroom design. There’s no need to stack towels behind the toilet, trip over dirty clothes on the floor, or go searching for toiletries. Add some floating shelves, include a shower storage niche like the one shown here, and maximize your vanity cabinet storage with customized accessories. Whatever your storage needs, a renovation is the perfect opportunity to find a place for all your soaps, linens, make up, and electronics. If you see mold and mildew build up in the bathroom, you may have a serious issue. Mold can have a negative impact on your family’s overall health and will affect resale value for your home. It must be addressed immediately. Use bleach to deal with minor mold, but if it is a bigger problem or keeps coming back, contact a professional to do mold testing or address the problem as part of an overall bathroom renovation. According to Angie’s List, a major bathroom remodel by a reputable contractor can garner the owner up to an 80-percent return on investment. Do any of these issues sound familiar? If you think it is time to update your bathroom, get inspired by our bathroom gallery and then contact us to talk to our experienced bathroom design team.